WHY WATCH VIDEOS AND READ BOOKS ON MUSIC? Musicians are like sponges…we absorb ideas at a rapid rate, and can’t seem to get enough information to help us on our quest to improve the playing of our instruments. Videos posted on sites like YouTube have the tremendous advantage that you can SEE and HEAR, and many of the world’s finest musicians give lessons online on SKYPE. 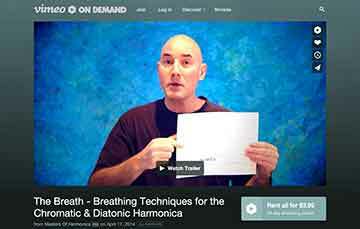 (See PRIVATE CHROMATIC HARMONICA LESSONS link on the homepage of our site, MASTERSOFHARMONICA.COM). Much of what we learn on chromatic harmonica involves a finely-tuned nuance…say the difference between correct and incorrect embouchure; or the 5 forms of vibrato; bends; or interpretative artistry. Here’s where the videos, articles and books really help…accessible 24 hours a day, to watch or read as many times as you like, a ready resource, convenient to use. The following comments from one of the leading music book publishers in the world, Chuck Sher (of Sher Music Company, SHERMUSIC.COM) illuminates many ideas relating to the value of videos and books. Making music happens on a lot of levels—emotional, spiritual/intuitive, physical and intellectual. As a long-time jazz player myself, I personally know that all of these factors have to be taken into account in order to play up to your potential. Everybody wants to play up to their potential, but not everyone makes it. I’ll add that for most musicians, making progress on their instrument is not what I’d call easy…and I’ve been there personally, struggling at home with new material. So you practice alone in a practice room or at home as you learn your instrument—along with the guidance of a good teacher, if you are lucky enough to have one, but good teachers are not available in all cities. Intellectual learning is one of the key factors affecting your progress on your instrument—and that’s where books can be of great help to you: intellectual knowledge. For deep knowledge of how music works, there is no substitute for reading method books, practicing what’s in them, and then working them out in the context of songs you will be performing. Max De Aloe’s METHOD FOR CHROMATIC HARMONICA; Mark Levine’s THE JAZZ THEORY BOOK; and Randy Halberstadt’s METAPHORS FOR THE MUSICIAN. Editor’s note: I have all 3 of these books and feel are are world-class and must-haves in your grouping of study materials. Chuck has spent a lifetime creating books, some very quirky and entertaining such as METAPHORS FOR THE MUSICIAN by Randy Halberstadt (Shermusic.com). Chuck, being a publisher of music books, is very familiar with how books can help players of chromatic harmonica.